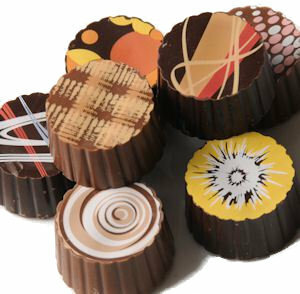 Gourmet Artisan Truffles are little works of art, beautifully decorated and delightfully flavored. The 12 piece box includes Key Lime, Champagne, Banana, Orange, Cappuccino, Chocolate (Milk and Dark), Hazelnut, Amaretto, Raspberry, Vanilla and Lemon. Sugar, Cocoa Mass, Cocoa Butter, Heavy Cream, Corn Syrup, Soy Lecithin (an emulsifier), Natural and Artificial Flavors, Vanilla Extract, Contains 0.5% or less of the following: Invertase, Natural Potassium Sorbate (preservative), Vegetable Fat, Skim Milk, Titanium Dioxide, Color (FD&C Blue 1 & 2, Yellow 5 & 6 and Red 40) and Iron Oxide.